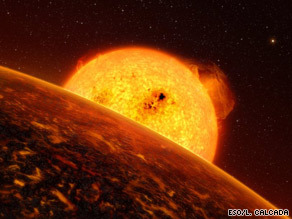 Astronomer: It is so close to the star it orbits that it may "look like Dante's Inferno"
(CNN) -- Scientists have discovered the first confirmed Earthlike planet outside our solar system, they announced Wednesday. An artist's impression shows what the planet may look like in close orbit with its sun. "This is the first confirmed rocky planet in another system," astronomer Artie Hatzes told CNN, contrasting the solid planet with gaseous ones like Jupiter and Saturn. But "Earthlike" is a relative term. The planet's composition may be similar to that of Earth, but its environment is more like a vision of hell, the project's lead astronomer said. It is so close to the star it orbits "that the place may well look like Dante's Inferno, with a probable temperature on its 'day face' above 3,600 degrees Fahrenheit (2,000 degrees Celsius) and minus-328 degrees Fahrenheit (minus 200 degrees Celsius) on its night face," said Didier Queloz of Geneva Observatory in Switzerland, the project leader. Hatzes, explaining that one side of the body is always facing the star and the other side always faces away, said the side "facing the sun is probably molten. The other side could actually have ice" if there is water on the planet. "We think it has no atmosphere to redistribute the heat," Hatzes told CNN from Barcelona, Spain, where he is attending the "Pathways Towards Habitable Planets" conference. The astronomers were stunned to find a rocky planet so near a star, he said. "We would have never dreamed you would find a rocky planet so close," he said. "Its year is less than one of our days." The planet, known as CoRoT-7b, was detected early last year, but it took months of observation to determine that it had a composition roughly similar to Earth's, the European Southern Observatory said in a statement. Astronomers were able to measure the dimensions of the planet by watching as it passed in front of the star it orbits, then carried out 70 hours of study of the planet's effect on its star to infer its weight. With that information in hand, they were able to calculate its density -- and were thrilled with what they found, Hatzes said. "What makes this exciting is you compare the density of this planet to the planets in our solar system, it's only Mercury, Venus and Earth that are similar," Hatzes, of the Thuringer observatory in Germany, told CNN. They were helped by the fact that CoRoT-7b is relatively close to Earth -- about 500 light years away, in the constellation of Monoceros, the Unicorn. "It's in our solar neighborhood," Hatzes said. "The thing that made it easier is it's relatively close, so it's relatively bright. If this star was much much farther away, we wouldn't have been able to do these measurements." At about five times Earth's mass (though not quite twice as large in circumference), it is the smallest planet ever spotted outside our solar system. It also has the fastest orbit. The planet whizzes around its star more than seven times faster than Earth moves, and is 23 times closer to the star than Mercury is to our sun. The planet was first detected early in 2008 by the CoRoT satellite, a 30-centimeter space telescope launched by the European Space Agency in December 2006, specifically with the mission of detecting rocky planets outside the solar system. At least 42 scientists at 17 institutions on three continents worked on the project. They are publishing their findings in a special issue of the Astronomy and Astrophysics journal on October 22 as "The CoRoT-7 Planetary System: Two Orbiting Super-Earths."